Sophfronia Scott lives in Sandy Hook, Connecticut where she continues to fight a losing battle against the weeds in her flowerbeds. She holds a BA in English from Harvard and an MFA in writing, fiction and creative nonfiction, from Vermont College of Fine Arts. Her latest novel is Unforgivable Love (William Morrow/HarperCollins). 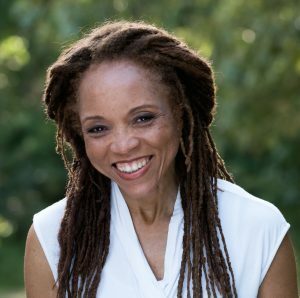 She’s also recently published a spiritual memoir, This Child of Faith: Raising a Spiritual Child in a Secular World, co-written with her son Tain, from Paraclete Press, and an essay collection, Love’s Long Line, from Ohio State University Press/Mad Creek Books. Sophfronia teaches creative writing at Regis University’s Mile High MFA and Bay Path University’s MFA in Creative Nonfiction. Her website is www.Sophfronia.com.